" Maria's one of my friends. It’s made a real difference having her visit me." 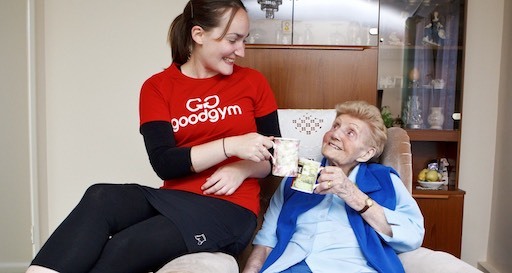 May, 99, was referred to GoodGym by her Occupational Therapist in 2012. May was born and raised in Tower Hamlets, in a house round the corner from where she lives now. May is from a big family and is one of seven children. May has had a very interesting life and worked in the catering business for many years, including for the war office and for cable & wireless. In her spare time, May used to be a seasoned ballroom sequence dancer, which she loved. It’s nice for people that can’t go out. My runner Maria is from America so she tells me all about the country and her family. She’s a very nice girl, very sensitive. She’s one of my friends. It’s made a real difference having her visit me. She’s always running! She’s done half marathons, she’s very good. I always ask her if she’s been running and encourage her to run. 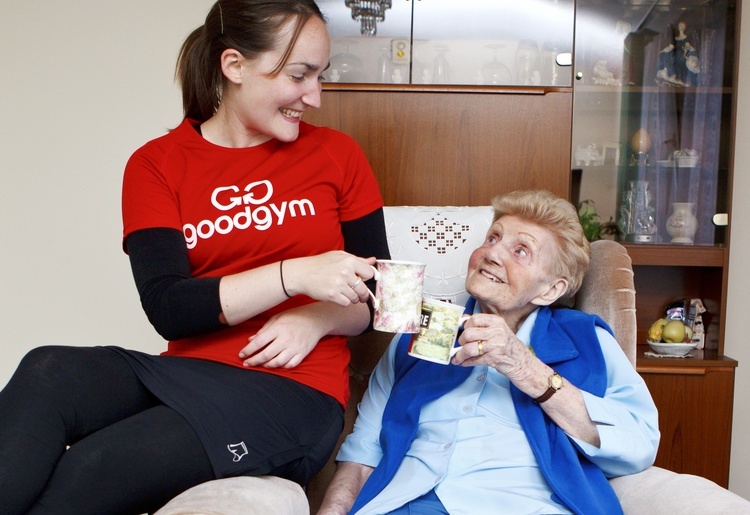 Maria got involved with GoodGym after seeing it a video about it online. She liked the combination of fitness and volunteering and the positive impact it could have on both the runner and the coach. Over the years, May and I have become good friends. We have so much to talk about! It doesn’t feel like I am volunteering anymore, I’m just visiting my friend. We enjoy having a cup of tea and talking about anything from my recent travels to current affairs. I’ve really enjoyed getting to know May and hearing about her life. I think having friends from different generations really broadens your outlook. It is amazing to hear about how much life May has seen, from childhood days in the East End (where she used to do athletics on the Victoria Park track! ), WWII, and now two London Olympics. May has been retired for a decade longer than I have been alive, so it really helps put things in perspective! To anyone thinking about getting paired up with a coach I’d say definitely do it. Being a coach runner can have a big impact on you and your coach. You never know, it might turn into a 4+ year friendship!